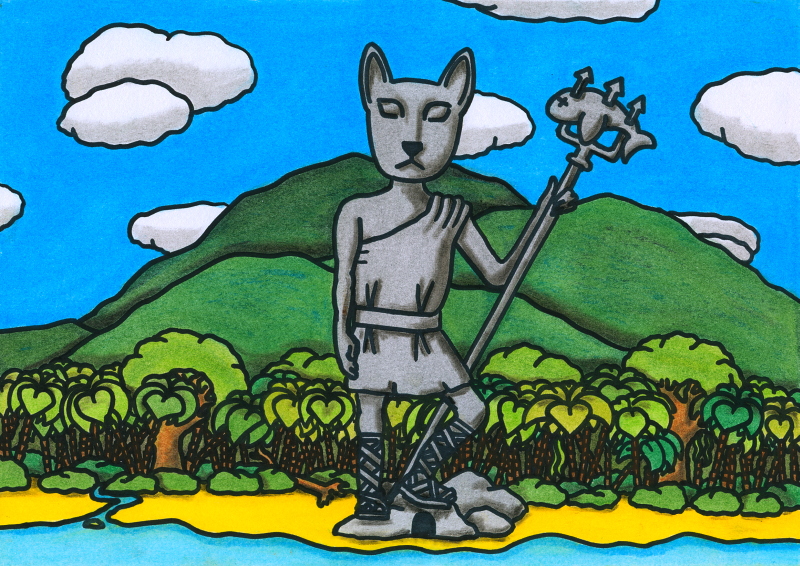 No-one is entirely certain where the statue of the great catanthrope that stands on a lonely island a few miles off the southern shores of Katsouli came from. The historian R.L. Smith once did a comprehensive study of all ancient sources relating to the catanthropes of the Gatoulian Sea, but found no mentions of its origin. Its existence even in the far past is attested to, but its builders remain completely mysterious. Reports by travellers only serve to confuse the matter further. An anonymous sailor from 12th-century Byzantium, passing through the region by accident, entered the small room at its base and reported that it was empty save for the writing on the walls, which he could not identify. Baruch de Spinoza, who spent several years living in Katsouli, claims the room contains stairs that lead down into some kind of labyrinth of mirrors; he does not state whether the labyrinth leads somewhere, but he does state that the air within smells of roasted fish. As for the compiler of the Compendium, he is not certain which theory is correct or which stories are true. He is also far from certain that the citizens of Katsouli truly do not know the origin of the statue. There is no evidence to back up this suspicion, but look at their eyes. They know a lot more than they’re telling. And if one thing is certain, it is that never – not once in all its long history – has Katsouli been attacked from the south. This entry in the Oneiropolis Compendium was made possible by Michael Brough.